Mom seems to be ramping up how much she makes me wear the harness. She was kind of slacking for a while because she wasn’t feeling well, and when she was, she was busy. But now, she says, our big change (she still hasn’t told us what that is) is coming soon and she wants me to be walking on a leash. I still kind of get stuck in place when she puts it on. When I do get up and walk around, it’s like I can’t stand up and I slink around. I see mom grinning and I hear her chuckling when I do this, even though she tries to hide it. I don’t think it is one bit amusing. She’s been giving me catnip when she puts it on to distract me and, I have to admit, it does the job, at least for a while. Have I mentioned that I do love the nip? Mom says she hasn’t told us what the big change is yet because so many things are still up in the air. She says a few things are falling into place now so she knows better when it will happen. I guess she will tell us when she feels the time is right! It seems like boxes might have a lot to do with this big change. She has brought so many new ones into the house. It has been quite exciting and challenging. I can’t wait to tell you all about it, what ever it is. 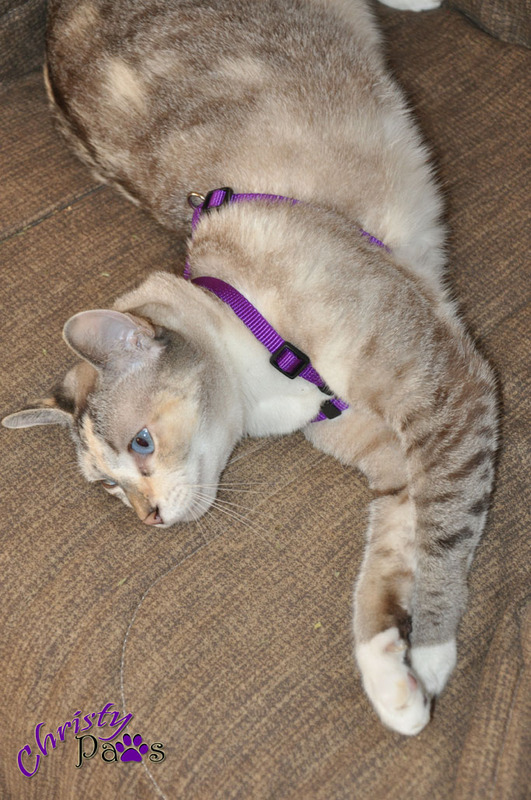 Tagged cat, harness, harness training. Bookmark the permalink. Me too thinks it´s sounds like you are mowing. Maybe chasing some wand toys while in the harness would help distract you. Boxes? Boxes are wonderful. I hope you get to play in some of them. I didn’t like wearing my harness at first either. But now I don’t mind it…’specially if it means I get to go outside! Are you guys moving? That’s what it sounds like! It does seem like that, doesn’t it? So glad to hear your are making progress with your harness! Can’t wait to hear about your big change! Oh Wow Christy Paws weez can’t wait to hear yous news bout da big change. Yous look gweat in yous hawness. Meez has a cloth one dat fits mowe like a jacket, and me luvs it. It always means adventures at hand. 🙂 Good Luck.